Basotect acoustic panel, circular diam. 600mm, 400mm and 300mm (50mm thickness). Self-installable, glued assembly with Skac Adhesive. Sold in units! Made by Basotect® melamine resin foam, it has a high sound absorption capacity, excellent durability and fire resistance of Class B-s1,d0 (Class 1), mandatory requirement for installation on ceilings and walls of public premises. The design in circular format of different diameters allows great aesthetic adaptability with a multitude of possible combinations, a really quick and simple installation. Basotect sound absorber panel with classification of reaction to fire: Class B-s1,d0 (Class 1). The panels are suitable for installation in public places. CIRKEL, is an excellent soundproofing solution, ultra-simple, self-installable, developed to solve the problems derived from the excess of reverberation (echo) existing in public places such as: restaurants, bars, cafe, celebration venues, classrooms, dining rooms, offices, meeting room, call centre, co-working, libraries, clinics, training academies, dance schools, etc. in a fast, efficient and economical way. 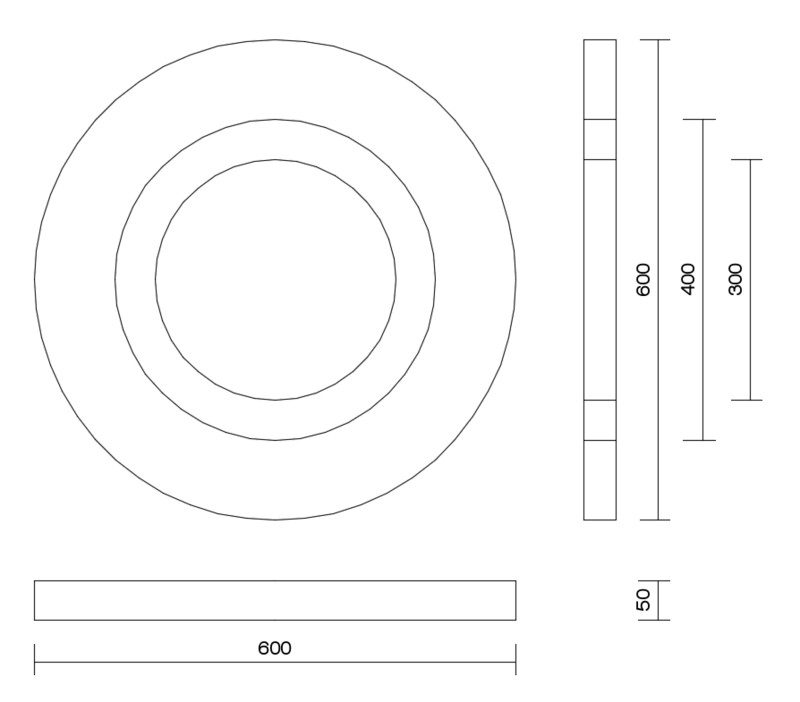 Panels of: 50mm thickness and diameters of: 600mm, 400mm and 300mm. Sold in units: Coverage area = D60 (0.28 m2/u. ), D40 (0.13 m2/u. ), D30 (0.07 m2/u.). CIRKEL acoustic panels can be supplied painted in a wide variety of colours (single or combined), or they can be coated with an exclusive textile covering for a superior finish in a wide range of colours. We can also manufacture custom panels with diameters up to 2.500mm and 500mm thick. Contact us to offer you a customized solution for your needs. The CIRKEL acoustic panels are installed in a really easy, fast and clean way. They are installed directly fixed to the ceiling or walls * using our mounting adhesive Skac Adhesive; It is only necessary to apply adhesive on the back of the panel, place the panel on the surface and press lightly with the palm of your hand, in 10 seconds it will be installed. Thanks to its circular design, it is not necessary to carry out a previous approach of installation, it is simply a matter of finding a space and install the corresponding diameter panel in a completely random way. It is recommended to install the largest acoustic panels (D60) first, and gradually reduce the diameter until filling the available spaces with the smaller panels. For a simple and effective solution, we have prepared a mini-guide that will help you to easily determine the panels that you need for your particular case, based on the m2 of flooring surface, room height and the level of comfort you want to obtain. the standard grade; a balanced ratio between the quantity and grade of sound absorption; defined to achieve an adequate level of sound comfort for holding conversations without raising ones voice: restaurants, classrooms, and offices. Then, based on the comfort level selected above, we will set the % of room area that must be covered with acoustic panels. Finally, with a simple multiplication, we will determine the total area (m2) of CIRKEL panels that have to be installed. Total area = m2 of room x % of coverage. 60% of the total area will be covered with panels D60 + 30% with panels D40 and the remaining 10% with panels of smaller size D30. Restaurant with a total area of 200m2, of which 120m2 are destined to the area of tables (diners); the total height of room is 3m. We want to get a 'medium' comfort grade; that it's coverage of 40% for spaces up to 3m of height. The total surface to be covered with CIRKEL will be = 120m2 x 40% = 48m2. The quantity calculations indicated above is a simplified selection guide. If you have any queries or you want that our acousticians make you a customized proposal, please contact us!. Tell us what kind of place this it is, size / height and we will make an appropriate proposal for the required amount to be supplied of acoustic panels.